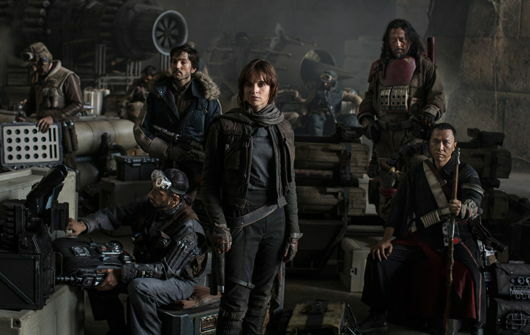 Walt Disney Studios exploits their acquisition of Lucasfilm properties to the fullest with Rogue One: A Star Wars Story, the first of several planned spinoff features to take place outside of the regular “Episode” series. Set just before the events of George Lucas’ original 1977 blockbuster, the Jedi-free film continues in the tradition of demystification as the prequel trilogy by setting up events in A New Hope. And while Rogue One hopes to answer several lingering questions, it doesn’t have a significant bearing on the other films beyond a marginal expansion of the mythology, allowing fans to say, “So that’s how that happened.” The primary difference between the abortive prequel trilogy and Rogue One is quite simply this: the new film isn’t terrible. Actually, it’s rather good within the finite limitations of its concept, which I plan to discuss in detail. Consider yourself forewarned that this review will reveal plot specifics, since an examination of how the story is just filler leads to my determination that, no matter how well-made or refreshingly self-serious, Rogue One is, conceptually, disposable entertainment. Director Gareth Edwards (Monsters, 2014’s Godzilla) helms this grim wartime space opera that doesn’t have the charm or breeziness of last year’s The Force Awakens, but it has an undeniable narrative thrust. 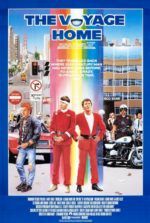 Working from a script by Chris Weitz and Tony Gilroy, the production reportedly underwent extensive reshoots with Gilroy in the director’s chair, although there’s no stylistic disparity onscreen as a result of two filmmakers operating at different times. The story follows a rebel mission to acquire plans to the first moon-sized Death Star, the Empire’s dreaded, weaponized headquarters, which Luke Skywalker later detonated with a single shot. Along the way, it answers questions most fans have happily lived without for the last 39 years: How did Princess Leia get her hands on the Death Star schematics? And how could a single shot blow up a massive space station anyway? 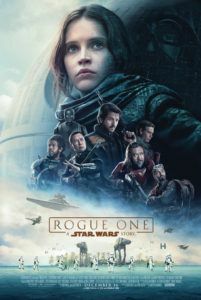 Opening without the customary scrolling titles that set the stage, Rogue One tells a galaxy-sized version of The Bridge on the River Kwai, The Dirty Dozen, or Saving Private Ryan—a perilous mission carried out by a small team willing to accept their ill fates for a greater cause. Jyn Erso (Felicity Jones) went into hiding as a child after her father, Galen (Mads Mikkelsen), was taken to help design the Death Star for Orson Krennic (Ben Mendelsohn), the Empire’s Director of Advanced Weapons Research. When Jyn, who has kept out of the conflict between the Rebel Alliance and Galactic Empire for the last fifteen years, finds herself in rebel custody, she’s tasked with gaining information about her father’s efforts to create the planet-killing Imperial weapon. She soon learns that her father intentionally built a weakness in the base’s structure. But with the Rebel Alliance unwilling to engage in a frontal attack on an Imperial data facility to obtain the Death Star’s schematics, Jyn must recruit a ragtag group of heroes and carry out the mission herself. Each character to accompany Jyn is but a kernel we’ll never get to see pop (for the same reason Darth Maul or Qui-Gon Jinn were so limited). Diego Luna plays Cassian Andor, a Rebel spy and assassin who suggests he’s done unspeakable things in the name of the Rebel cause, bringing a new dynamic to the conflict’s good-evil polarization. Ip Man himself, Donnie Yen plays Chirrut Îmwe, a sightless warrior with uncertain connections to The Force (and the Star Wars equivalent of Zatoichi, the Blind Swordsman). Baze Malbus (Wen Jiang) is another kind of warrior, a strong-but-silent bruiser armed with heavy weaponry. Riz Ahmed stars as Bodhi Rook, a nervous pilot. And Alan Tudyk voices a droid named K-2SO, whose filter circuits have been scrambled, resulting in a dry, sarcastic character. Elsewhere, Forrest Whitaker gives a fascinating and all-too-brief turn as Saw Gerrera, the cyborg extremist who helped raise Jyn. The meandering first-half gradually sets up a conclusion that balances a tense infiltration of an Imperial data tower, a diversionary ground battle, and a dizzying series of dogfights in space. Each of these segments has been informed by traditional World War II films, which are obvious influences for the director(s). Although Edwards (and Gilroy) assemble wonderfully staged and exciting action, characters are introduced and disposed of far too soon. Then again, given the film’s chronological place in the franchise, our foreknowledge that the Rebel Alliance eventually receives the stolen plans, and the fact that we never see Rogue One’s characters in any sequels, there’s a limited degree of discovery or new information to be experienced through the story. Going into a film like this, we can safely assume our heroes successfully acquire the schematics, but we can also assume that, by the end, they either die or disappear into thin air. Already knowing the finale’s obligatory touchstones inherently lessens our emotional involvement, though a more captivating group of heroes would have helped. Callbacks to A New Hope prove a distracting element throughout Rogue One. Consider the presence of Death Star overseer Grand Moff Tarkin, originally played by Peter Cushing (1913-1994), here by actor Guy Henry under a Cushing mask of CGI. Along with a brief appearance by Princess Leia in the final scene, Rogue One recreates these actors in their 1977 states (alive, younger) with computer animation, entering into the rather disturbing Uncanny Valley to do so. Trying to pay attention to Tarkin’s plot-heavy dialogue as the formerly real-life actor speaks before us proves impossible. Darth Vader also plays a significant role in the finale of Rogue One, regaining his cruel streak from A New Hope that Lucas tempered to appease his younger audiences and sell more toys. But once again, and at long last, Darth Vader (still voiced by James Earl Jones) demonstrates why he was feared throughout the galaxy, and it’s not for his use of an uncharacteristic pun. Elsewhere, visual nods to the original film appear and seem like unnecessary fan service (a description that might apply to this entire production). Viewers may notice a suspicious lack of alien species onscreen compared to earlier entries, as Rogue One seems less interested in appealing to a younger demographic through cutsie Ewoks, peppy droids, or a detestable equivalent to Jar Jar Binks (K-2SO won’t nab the hearts of children). The few aliens to appear look great, though, as the filmmakers follow J.J. Abrams’ retro-style use of practical makeup, tactile set pieces, and far less reliance on CGI. Of course, the space battles and ground war sequences use computerized special FX, but the quality surpasses the digital cartoonery Lucas forced us to endure in his prequels. Meanwhile, the ethnically diverse performers lend presence to their characters, building on, but not making up for, the screenplay’s deficiency of personality. Indeed, this joy-free film contains no laughs, no blithe moments of banter, and no romance. However engaging, it’s just not a very fun Star Wars film. If there are more “Star Wars Stories” in this spinoff form, then Disney has the potential to mirror what they’ve done with Marvel, making each new entry a genre-within-a-genre. For instance, Ant-Man is a heist film within the larger context of a superhero yarn. Following that trend, Rogue One stands as a grim World War II film inside the Star Wars universe. What genres will the young Han Solo and Boba Fett spinoffs adopt? What consequence will they bear on the more significant Episodes, if any? 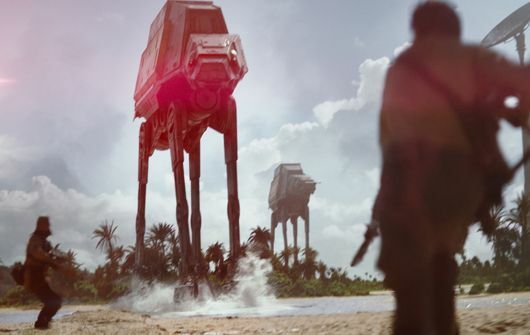 Rogue One (much like The Force Awakes, in retrospect) feels like fan fiction designed to write around the more distracting plot elements and unanswered questions left by Lucas’ story-centric writing and myth-making. Fortunately, the new Star Wars films remain so confidently assembled by talented directors, who are also franchise fans, that everyone is desperate to deliver a polished final product. Even so, after watching the film, which admittedly I wanted to enjoy more than I did, I asked myself whether Rogue One would have worked without any association to Star Wars whatsoever. I answered myself in two parts: First, it’s a silly question because, after all, Rogue One’s sub-title is “A Star Wars Story,” and so it remains inextricably linked to all the extratextual baggage viewers bring to any Star Wars film (the other seven films, the franchise’s commercialism, the pop-culture saturation, etc.). There’s no separating them. Second, the answer is no, I would not have enjoyed this wartime space epic apart from its references to the larger franchise. The reason for this lies in the characters, their thinly drawn personalities and lack of emotional consequence, and the general joylessness of the proceedings. Even The Bridge on the River Kwai offers moments of levity or slight humor, while Rogue One does not justify its dour tone with a corresponding emotional foundation built around its characters—just a vague theme about having hope in the face of oppression (a timely message, to be sure). Diverting and well-made though the picture may be, Rogue One ultimately serves no real purpose beyond fleshing-out established material (and providing Disney with another billion or so in revenue, not to mention cross-promotional revenues). 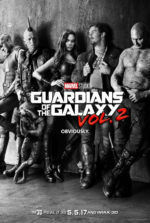 The film remains jealously devoted to its plot by providing mortar to larger Episodes in the franchise; however, in doing so, it forgets about developing its characters in any meaningful way. Indeed, audiences and superfans have endured, just as the Star Wars phenomenon transformed into a kind of pop-culture religion, without having the answers that Rogue One supplies. 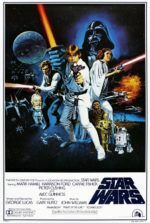 Certainly, the film’s details add a touch of gray to the white Rebel Alliance and black Imperial Empire, but the film does not deepen Star Wars mythology; it just expands it. Fans will be pleased to welcome the film into the ongoing and ever-expanding universe Lucas created, but there’s nothing so essential to call Rogue One vital.